The second day of the Round of 16 offers up 4 tantalising games that, on paper at least, should be closer than the games that were scheduled for Saturday. This isn’t how it always pans out but if you are looking for thrilling games that go to the wire; this is the day to look out for. There won’t be a host nation involved on Sunday, which means the crowd may be slightly flatter and smaller, but there should still be plenty of great basketball action to look out for and bet on. There is probably a lot to say for the fact that there isn’t a great deal between the teams who finished second in one group and third in another. If the Czech Republic managed to hold on in their final group game, they would have finished much higher in their group, so it is not as Croatia have received too much of a benefit by finishing second to Greece in their own group. 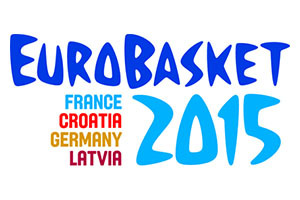 With the Croatians now playing outside of Zagreb for the first time in the tournament, they will need to dig deep within themselves to continue their run in the 2015 EuroBasket event. Taking the Croatia, at -7.5 in this game, at odds of 1.90, is likely to be a good starting bet for your Sunday EuroBasket betting activities. For the Over/Under market, you should look to go OVER 143.5 at odds of 1.90. Bet Now! It was a tough group for Serbia so to come out with a 5-0 record indicates that this is a team that has plenty in its favour. Sometimes teams can come out of the blocks too quickly, impressing in the group stages and then faltering in the knock-out round. It remains to be seen how strong the Serbians will be as the tournament progresses, but they should have more than enough to make their way past the Finnish side, who performed extremely well to reach the knock-out stages. The misfiring of the Russians was probably as much a factor in Finland making it through the group as opposed to anything the Finnish side managed, but they will likely put up a fight in this one. Taking Serbia at -14.5, at odds of 1.90, isn’t a bad bet for a knock-out round match where there will be a great deal of pressure on Finland. For the Over/Under market, look to go UNDER 155.5 at odds of 1.90. Bet Now! One thing that Israel has in their favour for this game was the fact that they managed to rest a few players. As did France in that game, which is the benefit of facing the group hosts and favourites in the final game when you have earned enough points, but this means that Omri Casspi will have had a few days’ worth of rest leading into this one. Casspi has been at the heart of virtually everything positive that Israel has achieved in this tournament so far and this may be bad news for Italy. The Italians will feel a bit aggrieved about finishing below Spain even though they handed out a strong beating to the Spanish in the group stages, but they should have some confidence coming into this game. Danilo Gallinari has been in excellent form for the Italian team and he is likely to be the man pulling the strings if Italy performs to a high standard. This could go either way but Italy appears to have a bit more about so taking Italy at -6.5, at odds of 1.90, should be a decent bet. If you are looking to take advantage of the Over/Under market, look to go UNDER 157.5 at odds of 1.90. Bet Now! According to the bookmakers, this is going to be one of the closet matches of the weekend, and you can see why. Lithuania topped their group but they were never really convincing. They were the only group winners without a perfect record and they required a great showing at the end of their final game (including overtime) to take top spot. Georgia on the other hand just about scraped the final qualifying position from a tight group, but they will be buoyed by their appearance in this round. Taking Lithuania at -6, at odds of 1.90, isn’t a bad bet at all, but this is a very tight game to call. For the Over/Under market, look to go OVER 140.0 at odds of 1.90. Bet Now! With respect to the quarter finals, the winning teams on Sunday will play their next game on Wednesday the 16th of September. The first quarter-final will be between the winners of the Serbia v Finland match and the winners of the Croatia v Czech Republic match. The second quarter-final will be between the winners of the Israel v Italy match and the Lithuania v Georgia match.